The Public Interest and Accountability Committee (PIAC) has accused the Ministry of Finance of failing to account for over ¢403. 74 million revenue from the annual budgetary allocation from oil revenues. According to PIAC, it is dissatisfied with the response of the Ministry of Finance on the utilization of the funds. 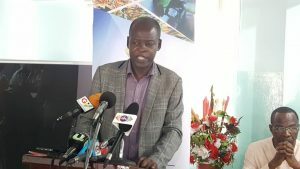 Speaking at a Press Conference, the Chairman of the committee Dr. Steve Manteaw said PIAC would use every option available to seek answers from the finance ministry including resorting to the Special Prosecutor’s office, Economic and Organised Crime Office [EOCO] as well as other state institutions. Dr. Steve Manteaw explained that although the committee initially wrote to the Ministry of Finance for clarification on how the monies from the Annual Budget Funding Allocation [ABFA] 2017 was used, the ministry failed to reply PIAC’s letter and instead chose to respond in a Ghanaian Times Newspaper publication dated October 10th, 2018. He explained that PIAC intends to pursue the matter ‘relentlessly’ until it reaches a logical conclusion. PIAC in a press statement earlier also accused the Ministry of Finance of failing to adequately respond to the committee’s request for the half-year data for 2018. According to the statement, PIAC has been unable to meet its statutory reporting timeline which was set on 15th September 2018. “Our request for the half-year data for 2018 has not been fully responded to. We requested the data on 17th July 2018 to enable us to put together our half-year report. The Ministry has so far provided data on ABFA allocations but has failed to release data on expenditure. As a result, PIAC has not been able to meet its statutory reporting timeline of September 15th for the report in question,” Excepts of PIAC’s statement read. The post PIAC to drag Ministry of Finance to Special Prosecutor over missing ¢400m appeared first on Citi Newsroom.